Altitude : 6201ft above sea level. 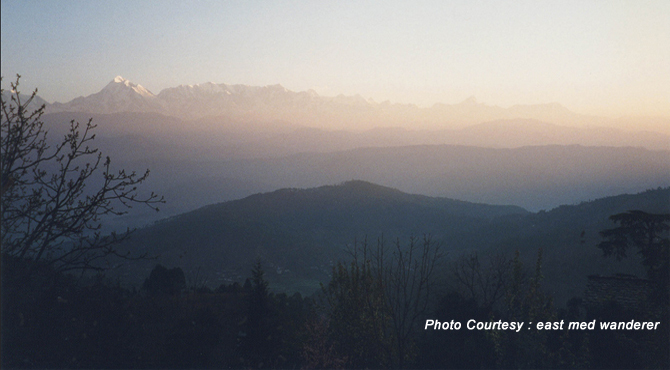 Located 53 km to the north west of Almora, Kausani is tucked away atop a narrow hidden ridge at 6201ft. Situated in Bageshwar district of the Kumaon region of Uttarakhand state, Kausani stands amidst thick pine trees overlooking Someshwar valley on one side and Garur and Baijnath Katyuri valley on the other side of Almora-Bageshwar-Didihat Highway. It is famous for its scenic splendor and its spectacular view of a 350 km stretch of Himalayan Peaks. From here, one can see the settlements of the Katyur valley, the river Gomti far below. It was Mahatma Gandhi who named Kausani as 'the Switzerland of India' and in the winter months, after a snowfall, the scenic splendour of Kausani justifies this comparison. In 1929, Mahatma Gandhi stayed here at the Anasakti Ashram and wrote Anashakti Yoga. Kausani is also famous for being the birthplace of the renowned Hindi poet- Sumitra Nandan Pant. Kausani is an untouched retreat with plenty to offer both peace and amusement. Covered by a thick canopy of pine forests, and dotted with pear orchards and tea gardens, it welcomes tourists with an exhilarating fresh air, the aroma of the deciduous pines and the friendly nature of its people. From here, one can also get a spectacular view of the snow-capped Nanda Devi, second highest peak of India at 7817m, Mt Trishul (a symbolic of Lord Shiva’s three-pronged instrument and his wife’s veil) and Nanda Ghunti. Nanda Kot, Panchchuli, Mrigathuni, Nilkanth peaks are also viewed from Kausani. Kausani is also famous for tea gardens and pear orchards. The remains of the tea estate developed during the British rule can still be seen here. Girias Uttaranchal tea estate is famous among them. There is a pleasant 2 km walk from near the KMVN hotel through the tea gardens to the factory on the main road. One can also visit the factory where they will explain to the visitors the whole process of drying of the leaves, packing, sorting etc. Kausani is good for trekking and one can enjoy the beauty of Kausani in the Adi Kailash trek, Bageswar Sunderdhanga trek and a short trek to Rudrahari waterfalls which is on the Kausani Almora road. Anashakti Ashram, also known as Gandhi Ashram is a calm and seclude place where Gandhiji spent some days. It was during that period Mahatma Gandhi had written the Anashkti Yog inspired by the vistas. Set against the majestic views of Himalayan ranges, it is the highest point in Kausani which also offers its visitors a stunning view of the sunset. The Ashram has a good resting place for tourists with a large courtyard with a small retreat hall. Daily prayers are held morning and evening. It also has a library and a research centre. Set up by Sarla Ben, a disciple of Gandhi, in 1964, Lakshmi Ashram is situated 1 km from the Anasakti Ashram. Located in a serene atmosphere, several skills like growing vegetables, cooking, caring for the animals and cleaning are taught to poor girls and woman of Kausani village for explore their potential and strengthen skills. Situated near the bus stand at Kasauni, The memorial of Sumitra Nandan Pant, one of the most famous modern Hindi poets is worth a visit. He got the highest literary award, the 'Jnanpith' in 1968. The building where he spent his childhood, has been now converted into a museum which displays his daily use articles, poems, letters, awards etc. It is now under the control of the Department of Archaeology of the state of Uttrakhand. On his birth anniversary (20th May) every year Kavi Sammelan is organised by local poets here. Also known as Bhramari Devi temple, Kot Bhramari Temple is situated on the top of a hill with in a fort. Located 5 kms from Kasauni town, it is believed that Adi Guru Shankaracharya made a stay here on the way during his journey to Garhwal region. A three day fair is held at Kot ki mai or Kot bhramari devi every year on Nanda Ashtami in the month of Aug/Sept. Katarmal Sun Temple is the second in importance after the Sun Temple Konark, in Orissa. Known to the locals as Surya Mandir, it is dedicated to Burhadita or Vraddhaditya the old Sun God. 10 kms from Kausani, it is situated alongside of the River Gomti at an altitude of 1,234meters. Built by Katarmalla, a Katyuri King, the stone complex of 44 smaller shrines is over 800-year old. But the present mandapa and many of the shrines within the complex have been constructed later. Of the nearly 60 idols there, the oldest is 900 years old. The temple houses the idols of Shiva-Parvati and Lakshmi-Narayana. Kainchi is known for its Kainchi Ashram. Founded by Neem Karoli Baba, hundreds of devotees daily visits this ashram.He is said to have established 108 temples all over India and is worshipped as an avatar of God Hanuman. It is built into the mountainside on a river in a steep, narrow valley. The name Kainchi meaning scissors refers to the hairpin roads. The Ashram opens during March to September, the rest of the year this is closed to visitors. Situated 39 kms from Kasauni, Bageshwar is one of the important places in the hills of kumoan. Situated on the confluence of Gomti and Saryu rivers, it is a sacred place dotted with a lot of temples. Devotees believes that Bageshwar is blessed by Lord Shiva.The famous temple in Bageshwar, Baghwath Temple hosts the biggest Uttaryani Mela which is organised every year in January.